After participating in the “Impressões” project, promoted by Roca in 2014, where the purpose was to customize the washbasin Living City, the architect and designer Fernanda Marques, based in São Paulo, collaborates again with the Spanish company. This time in the completion of her first washbasin collection for Roca, the Infinity collection. The design explores the company’s innovative ultra-light technology that provides rounded edges with extremely thin walls. “It is a vigorous design that expresses dynamism, energy, and at the same time does not impose itself in spaces, on the contrary, it harmonizes with them.” synthesizes Fernanda. “In addition to allowing the construction of more robust parts, the technology makes it possible to obtain more ecological and light objects, so I opted to accentuate the three dimensionality of the design, while at the same time, I tried to highlight the possibilities offered by the raw material.” comments Fernanda, who was able to print to her washbasin the same rigor and minimalism that characterizes her architecture and interior designs. Contrasting well-defined lines and rounded edges, the object gained two versions: one with a metallic soap dish built in the side and the other with the component emerging from the inside of the washbasin, with a textured area to prevent the soap from slipping, and, at the same time, minimizing stains. 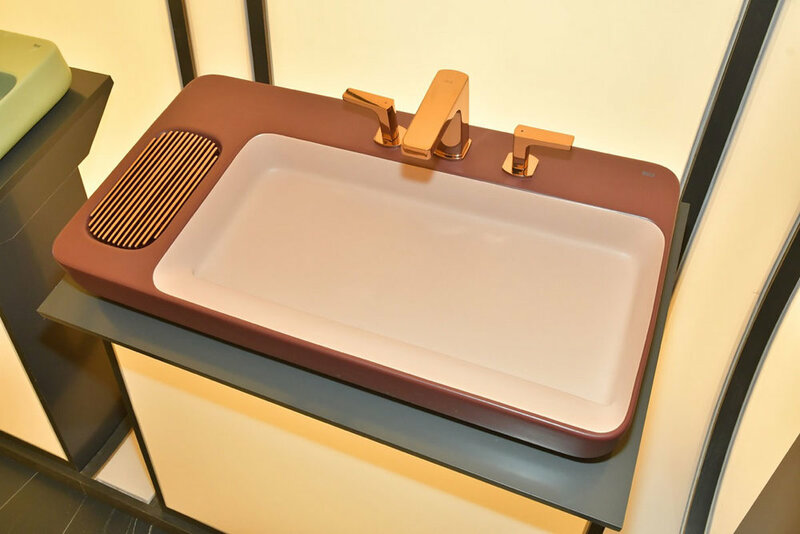 The washbasin won the Best in Show prize at the Expo Revestir 2019.